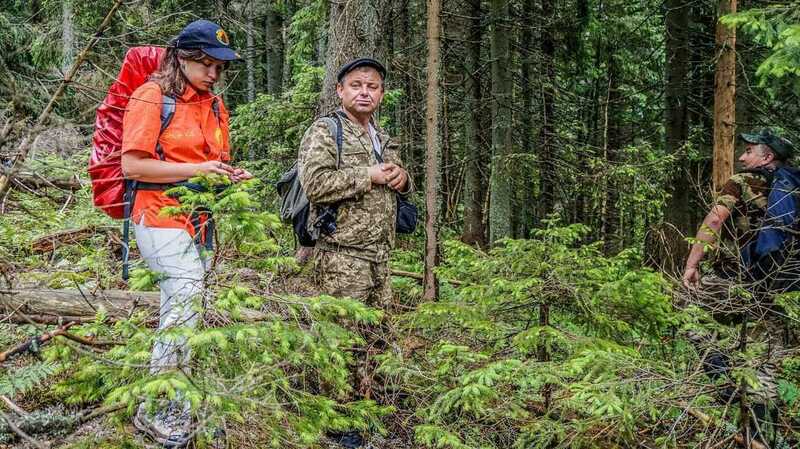 Three new Wilderness Candidates in Ukraine were assessed in the previous days. The team of the European Wilderness Society experts visited potential wilderness in National Nature Park Synevyr, Gorgany Nature Reserve and Carpathian National Nature Park. Management organisations of all these protected areas invited the European Wilderness Society experts to carry out first short assessment and judge if part of their territory can became a respective candidate of the European Wilderness Network. Vlado Vancura, Deputy Chairman and Mariana Matsko, Project Administration of the European Wilderness Society spent more than week traveling to visit theses parks, meet either directors or deputy directors responsible for wilderness management, local rangers and together with them visited the proposed areas to assess the quality of wilderness. National Nature Park Synevyr is one of the largest protected area in the Ukrainian TransCarpathian region (43,040 ha). The area is classified as IUCN category V where sustainable tourism is one of the main objective. The park has a large regulated tourism zone. Nevertheless the park has also a large core zone and so become a candidate member of the European Wilderness Network. The European Wilderness Society team guided by deputy director and local ranger focused on part of the core zone with potential wilderness in the area named Black River. After demanding site assessment the European Wilderness Society experts concluded that ca 2 500 ha could meet the requirements of the European Wilderness Quality Standard and Audit System with possibility of enlargement in the coming years up to more than additional ca 4.000 ha. Gorgany Nature Reserve is situated in the central part of the Ukrainian Carpathian Mountains. The area is classified as IUCN category Ia and so is a good candidate to become a member of the European Wilderness Network. The area is currently strictly protected and any impacts are strictly controlled and limited to ensure protection of the conservation values. The total area of Gorgany Nature Reserve is 5 344,8 ha and the access to Gorgany Wilderness is difficult because of remoteness, extremely steep slopes and large scree areas covering mountain slopes. The outcome of the field assessment guided by chief of research and monitoring department and local ranger was conclusion that ca 3 000 ha could meet the requirements of the European Wilderness Quality Standard and Audit System with possibility of small enlargement in the coming years up to more than additional 1.500 ha. Carpathian National Nature Park is large protected area in the Ukrainian TransCarpathian region (50 495 ha). The area is classified as IUCN V where sustainable tourism is one of the main objective. The size of regulated tourism zone is 25.964 ha. Nevertheless the park has a core zone (11 400 ha) with strict protection and so become a candidate member of the European Wilderness Network. The park represents a wide spectrum of typical Carpathian ecosystems such as beech primeval forests, alpine meadows and wetland with the rich biological diversity. The visited potential wilderness area is located in the south-east corner of the park. The outcome of the field assessment guided by local ranger was conclusion that ca 3.000 ha could meet the requirements of the European Wilderness Quality Standard and Audit System with possibility of enlargement in the coming years up for additional ca 3.500 ha.